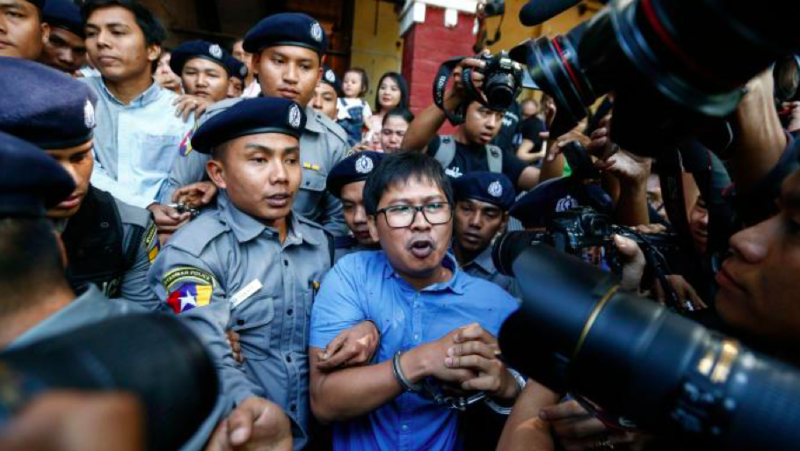 On September 3, Reuters journalists U Wa Lone and U Kyaw Soe Oo were convicted and sentenced to seven years in prison for violating an obscure British colonial-era law in what amounts to a show trial. This comes at the end of a nine-month trial in which the government of Myanmar attempted to convict the two investigative journalists. Currently, the Myanmar government is under under heavy international condemnation for its ongoing role in the Rohingya genocide and its increasing authoritarianism under State Counsellor Aung San Suu Kyi. Lone and Oo investigated the Inn Din Massacre, the killings of ten Rohingya Muslim men and teenagers by Myanmar soldiers in the Rakhine State village of Inn Din in September 2017. As a part of the Myanmar soldiers’ clearance operations in the region, the men killed were accused of being a part of the Arakan Rohingya Salvation Army(ARSA). According to Lone and Oo’s investigative exposé published in Reuters in February, the soldiers captured the suspected men and boys and photographed them on the beach. From the beach, they were marched them up a nearby mountain, where they were shot or hacked to death with machetes. This is but one instance of state violence against the Muslim Rohingya minority. Intergovernmental organization Association of Southeast Asian Nations (ASEAN) reports that over 43,000 Rohingya are missing and presumed dead at the hands of the majority-Buddhist military government. The two journalists were invited by Myanmar police to meet for dinner in the city of Yangon on December 12, 2017. Once they arrived, they were handed two pieces of paper by police officers whom they had never met. Sensing a set up, they left the restaurant, where they were arrested by another pair of officers under the Official Secrets Act, a 1923 British imperial law that has been enforced only once before. Section Three of the act concerns entrance into prohibited places, taking photographs, or holding secret offices documents that could be “directly or indirectly, useful to an enemy.” The act carries a maximum prison sentence of fourteen years. The pair were held in an undisclosed prison until appearing at dozens of highly-publicized pre-trial hearings. During the course of the trial, it became known that the documents the men had purportedly stolen were already publicly available. The police chief even testified in open court to an elaborate conspiracy to frame the two for their reporting. Nonetheless, Judge U Ye Lwin found that the men intentionally sought to undermine the security of the nation and endanger the lives of Myanmar military personnel. “It’s deeply troubling for everybody who has struggled so hard for media freedom. I think one has to ask will this process increase or decrease the confidence the people of Myanmar have in their justice system,” said Scot Marciel, who has served as U.S. Ambassador to the Republic of the Union of Burma since March 2016. Myanmar is ranked among the worst countries in the world for press freedom, described by media watchdog Freedom House as “Not Free” alongside Iraq, Afghanistan, and China. Burmese journalist Soe Moe Tun was murdered in December while investigating governmental complicity in the illegal logging industry, and two other journalists survived bombings while reporting on similar issues. A dangerous precedent has been set in jailing reporters for exposing governmental wrongdoing. Without journalists shining a light in the shadowy corners of power, the darkness may yet spread.